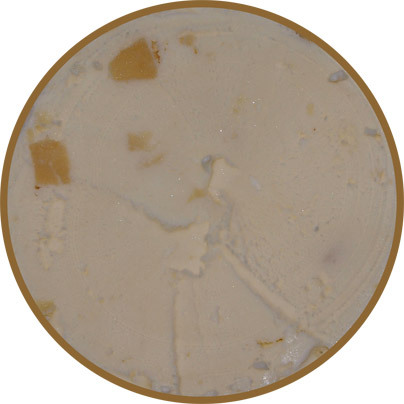 [New Pint form for 2013] As mentioned in our 2013 Product Guide, Ben & Jerry's has decided to take last year's scoop shop only test flavor Pina Colada and turn it into a limited edition pint flavor for our mid-year pleasure. The official release dates are from May to August, and sure enough, it's the beginning of May and what do we have here at Walmart? Tada! 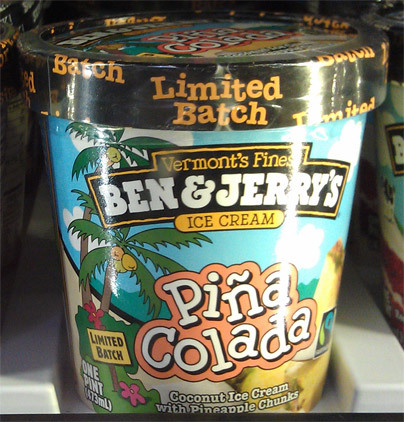 Ben & Jerry's Pina Colada is Coconut Ice Cream with Pineapple Chunks. My well known distrust of coconut and pineapple would have made me hesitant to try this one, but thankfully I got a test sample last year. So, there you have it, it's got the Dubba seal of approval. It's nothing crazy, no funny mix-ins, no swirls to aim for, but it adds a bit of fruity fun to Ben & Jerry's summer lineup. April 2014 Update: I still see these pints lingering on various store shelves, talk about zero interest! I guarantee this is one limited edition flavor that will never come back. It was just too tame for the masses. Its good, but I prefer HD's version. Hds I loved but it had rum in it. Which ordinarily would be fine but I ate it while pregnant and very cautious. I wonder of b&j's has rum?? i didn't taste any alcohol and I usually pick right up on it. next time i see a pint, I will doublecheck. I work at Ben and Jerry's and I have got to say, I love ice cream just as much as you guys do. This flavor is one of my favorites and was only in the dip case for a couple of months! If you haven't tried it yet, I recommend the peaches and cream!